IT WILL INSPIRE WARMTH FOR YOUR DÉCOR. 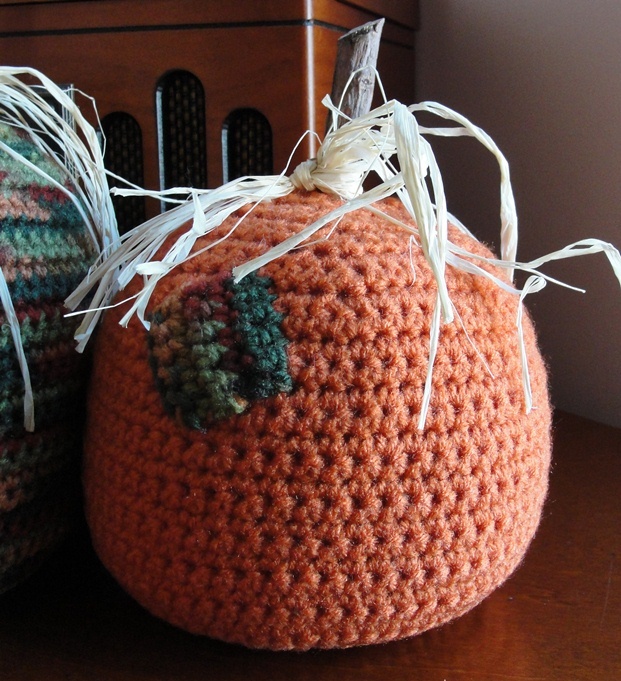 Size: Large Pumpkin measures 6-1/2” High & 7-1/2” Wide without stem. Rnd 1: Starting at Bottom, with Fall, ch 2; 6 sc in 2nd ch from hook; join with a sl st to first sc, ch 1, turn. (6). Rnd 2: 2 sc in ea sc around; join, ch 1, turn. (12). Rnd 5: (Sc in next 3 sc, 2 sc in next sc) around; join, ch 1, turn. (30). Rnd 6: (Sc in next 4 sc, 2 sc in next sc) around; join, ch 1, turn. (36). Rnd 7: (Sc in next 5 sc, 2 sc in next sc) around; join, ch 1, turn. (42). Rnd 8: (Sc in next 6 sc, 2 sc in next sc) around; join, ch 1, turn. (48). Rnd 9: (Sc in next 7 sc, 2 sc in next sc) around; join, ch 1, turn. (54). Rnd 10: (Sc in next 8 sc, 2 sc in next sc) around; join, ch 1, turn. (60). Rnd 11: (Sc in next 9 sc, 2 sc in next sc) around; join, ch 1, turn. (66). Rnd 12: (Sc in next 10 sc, 2 sc in next sc) around; join, ch 1, turn. (72). Rnd 13: (Sc in next 11 sc, 2 sc in next sc) around; join, ch 1, turn. (78). Rnds 14-34: Sc in ea sc around; join, ch 1, turn. (78). Rnd 35: (Sc in next 11 sc, dec over next 2 sc) around; join, ch 1, turn. (72). Rnd 36: (Sc in next 10 sc, dec over next 2 sc) around; join, ch 1, turn. (66). Rnd 37: (Sc in next 9 sc, dec over next 2 sc) around; join, ch 1, turn. (60). Rnd 38: (Sc in next 8 sc, dec over next 2 sc) around; join, ch 1, turn. (54). Rnd 39: (Sc in next 7 sc, dec over next 2 sc) around; join, ch 1, turn. (48). Rnd 40: (Sc in next 6 sc, dec over next 2 sc) around; join, ch 1, turn. (42). Rnd 41: (Sc in next 5 sc, dec over next 2 sc) around; join, ch 1, turn. (36). Rnd 42: (Sc in next 4 sc, dec over next 2 sc) around; join, ch 1, turn. (30). Rnd 43: (Sc in next 3 sc, dec over next 2 sc) around; join, ch 1, turn. (24). Rnd 44: (Sc in next 2 sc, dec over next 2 sc) around; join, ch 1, turn. (18). Rnd 45: (Sc in next sc, dec over next 2 sc) around; join with a sl st to first sc. Fasten off, leaving long length for sewing. Using a craft knife, cut ½” tree branch into one, 3” piece and two, 2-1/2” pieces. Thread length of yarn left from fastening off Rnd 45 into a tapestry needle. Thread through stitches of Rnd 45 to gather. Place glue on one end of the 3” piece of tree branch. Place glue-end down into opening of Rnd 45. Pull gathered stitches closed over branch to tighten and hold in place. Knot and secure in place with a few stitches. Let branch dry. Cut raffia into four 24” pieces. Tie the raffia pieces around stem of tree branch as shown in photo. Glue in place if needed to secure. Trim ends of raffia to desired length. Rnd 1: Starting at Bottom, with Carrot, ch 2; 6 sc in 2nd ch from hook; join with a sl st to first sc, ch 1, turn. (6). Rnds 2-10: Repeat Rnds 2-10 of Large Pumpkin. (60). Rnds 11-26: Sc in ea sc around; join, ch 1, turn. (60). Rnd 27: (Sc in next 8 sc, dec over next 2 sc) around; join, ch 1, turn. (54). Rnd 28: (Sc in next 7 sc, dec over next 2 sc) around; join, ch 1, turn. (48). Rnd 29: (Sc in next 6 sc, dec over next 2 sc) around; join, ch 1, turn. (42). Rnds 30-34: Repeat Rnds 40-44 of Large Pumpkin. (18). Rnd 35: (Sc in next sc, dec over next 2 sc) around; join with a sl st to first sc. Place glue on one end of the 2-1/2” piece of tree branch. Place glue-end down into opening of Rnd 35. Pull gathered stitches closed over branch to tighten and hold in place. Knot and secure in place with a few stitches. Let branch dry. Cut raffia into four 18” pieces. Tie the raffia pieces around stem of tree branch as shown in photo. Glue in place if needed to secure. Trim ends of raffia to desired length. Repeat FINISHING for second SMALL PUMPKIN. Rows 2-4: Sc in ea sc across, ch 1, turn. (4). Fasten off, leaving length for sewing. Sew small patch to bottom side of one pumpkin. Rows 2-5: Sc in ea sc across, ch 1, turn. (5). Fasten off, leaving length for sewing. 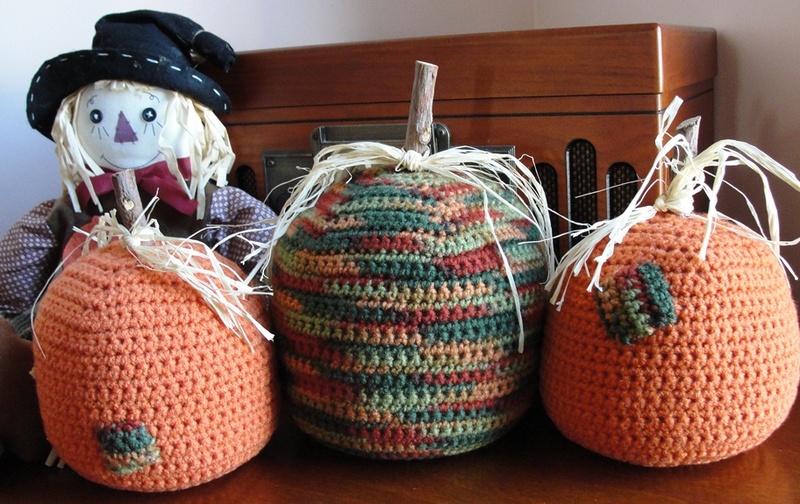 Sew large patch to top side of one pumpkin. Copyright 2011 Jocelyn Sass Cute Crochet All rights reserved.